This June marked the 20th anniversary of my graduation from Troy University, and after spending this week with 140 college students at a conference in Alabama, I can’t help but reflect on how students are different in the New South. 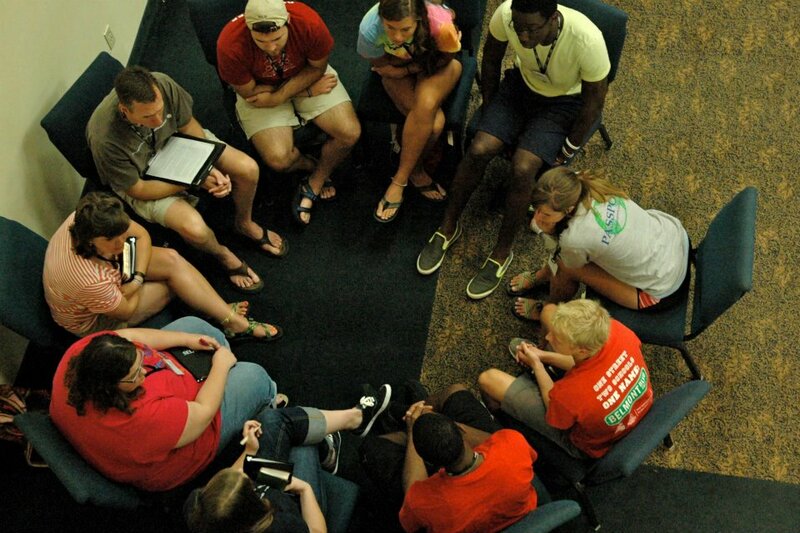 That’s me, the old guy on the left, leading a small group discussion at the SELAHvie conference for college students at Shocco Springs Conference Center in Alabama this week. Photo by Meggie Dant. First, New South collegians are well travelled. I never left the confines of the United States until I was 29. Today’s college students most likely have several stamps in their passports before they reach graduation. They have shrunk the world as they experience new cultures and visit what would have been considered exotic and remote locales back in my day. They are not only experienced travelers, they have a global worldview. They see how we are connected and how the actions of one country impact others. They understand intuitively that we are connected and cannot live in isolation. They have relationships with people in other countries and can personalize another cultural perspective. Second, students today don’t expect much from the economy. Yes, they have career aspirations and a strong sense of calling, but because they have been matriculating during a global economic downturn, they don’t take good jobs for granted. They also don’t base their identity on their careers. Of course, many of them are still sorting all that out, but in general, they don’t think of themselves as accountants, engineers, ministers, lawyers or physicians. They think of themselves as individuals first and people who have or need jobs second. They don’t define themselves by or invest too much ego in their future careers. Third, their closets are much less crowded with shoes. In fact, a single pair of flip flops can accessorize any outfit in their wardrobes. There is no occasion that is not appropriate for flip flops. I understand that this conference was in August, but I think they would acknowledge that their flip flop habit extends well beyond summer. When I was in college, the only flip flops I owned I wore in the community showers in the dorm. Now, students in the New South wear them everywhere. Students built community while at the SELAHvie conference. Photo by Meggie Dant. Fourth, today’s students appreciate the small gesture. Twenty years ago when we talked of changing the world, we seemed invested in the idea of the big change – world peace, ending hunger, curing cancer. This generation of collegians keeps those larger goals in perspective and understands that big change happens incrementally. They celebrate small victories and understand that something as minute and basic as a smile is a step toward world peace. This week they shared stories from their summers of how those little moments became powerful examples of larger changes in their lives and in the world around them. 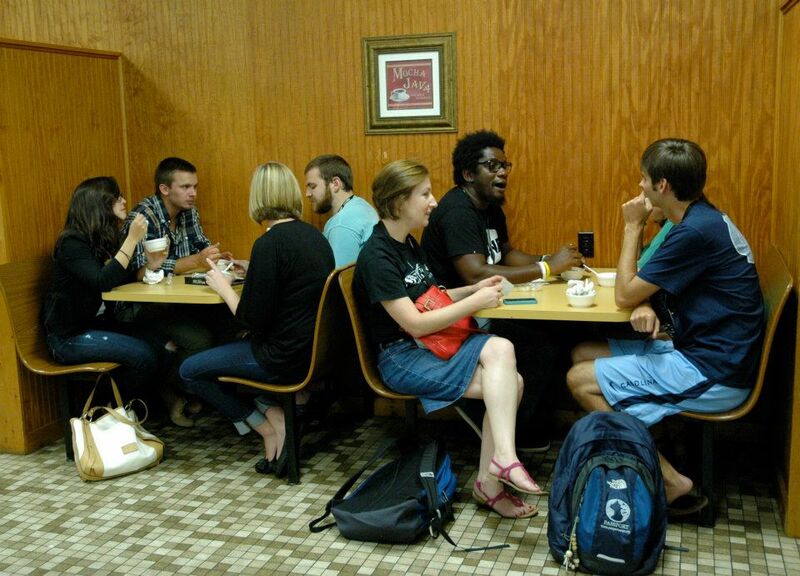 Finally, I observed that today’s college students seek out and build community wherever they go. I don’t even think community was a word 20 years ago. Or at least it wasn’t applied conceptually the way it is today among young people. This sense of community goes beyond fraternities and sororities, athletic teams, music and theater performers, dorm neighbors, social cliques, religious groups or other formal configurations of relationships. Community is a shared core value. They want to be able to share their lives with each other beyond one-on-one dating relationships, and they embrace shared experiences over rugged individualism. They appear to be less selfish, more giving and more open to living in a way that includes a larger network than we ever imagined 20 years ago. Why these sociological trends are so is a topic for another day, and I understand that I’m being overly general in this analysis. But as colleges welcome back students all across the South, they are welcoming back a different kind of student than the one who stepped foot on campus 20 years ago. But what do I know? I’m old school. New South Essays leaves open the possibility that these observations could be completely wrong! Feel free to share your thoughts by commenting below. This entry was posted in Uncategorized and tagged Alabama, college, contemporary South, Lance Elliott Wallace, Lance Wallace, New South, New South Essays, NewSouth, relationships, SELAHvie, South, Southern, Southern Culture, Southern Living, Southerners, student, students, the South, travel, Troy University, university. Bookmark the permalink. If you are “old school”, I guess I am “ancient school”. However, I was 16 when I first went abroad. Lance, that is heartening to know, though I’m afraid that may be a skewed sample, but the observations may be accurate for a portion of the population that is involved. The information on that wider generation of young people is a mixed bag – many of them exhibit less care for the environment, less involvement, more self indulgent. You saw what you wanted to see but the ideal is always worth looking for. Good observations and assessments, Lance.